I am strong. I will survive. So, the last time I posted was at Easter. That was when… The end of March?! Wow. Please accept my sincere apologies for not updating earlier, however, after this post, you will realise exactly why I’ve not been in the mood to write. Let me start off by saying, the blog you are about to read is true. This is not fictional in the slightest. I’ve read it over and over again, and even I think that if someone were to reel all this off to me as being the truth, I would not believe them. 2013. We’re not quite halfway through the year, and already I’m wishing the year would be over. It’s been a hell of a ride, and right from the very start it was bad news. The number 13 has always been lucky for me. The first house I lived in was a number 13. I had an amazing birthday party for my 13th birthday. The number 13 has come up a few times on the National Lottery (sorry, it’s called the Lotto now ha ha) and has won me a few £10 notes(!). Anyway, I’ve never had a problem with it until the year 2013. It started in January with my car. Basically, without going too much in to it, something happened and I couldn’t use my car. So the problem came about as to how am I going to get to work, go to the supermarket, go anywhere without my car. I worked 9 miles away. Buses are not an option for me (I have a genuine phobia of buses); the trains do not run to my schedule; and taxi’s would cost £20 each way… So that would be £120 in taxi costs each week as I work 3 days a week. My friend was able to pick me up from my home address and take me to and from work for the first week, but then the second week came… Thankfully my dad (retired) said that he’d take me, but the condition was that if he didn’t want to / couldn’t take me, I would have to make alternative arrangements. As most people are aware, I’m not particularly fond of my job, and this added stress was not helping with my feelings in the place. On most mornings, I would have to excuse myself from my desk and ‘nip to the bathrooms’ to calm myself down. My team leader must have got that fed up with me… But that was nothing to what was coming up. February came, and I thought the year was improving slightly. It was now 25 February, my mum’s 60th birthday. About an hour before we were due to go out for the evening, William had decided to fall and hit his head rather violently on the radiator. It ‘egged’ immediately, and a massive bruise came up within minutes. Other than that, he was ok, luckily. We went to a Greek / Cypriot restaurant and were having an amazing start to the evening when my aunt received a phone call and had to depart rather rapidly. My aunt’s house had been broken into. Her laptop and phone had been taken and my uncles android tablet had been taken. My other uncle and his wife were staying at my aunts, and their car had been stolen… An abrupt ending to the evening for them. The 23 March was Michaels’ birthday. Happy birthday. He was discharged to a house smelling like vomit, a very sick little man and a wife who was so exhausted that all she wanted to do was go to bed and not get up for a week. But even though I felt like that, I still stayed on the blow-up mattress in the living room with William to prevent any disturbances to Michaels’ recovery time. It’s Easter Sunday. My mum has just arrived to pick William and I up to go to an Easter party. It was only a small one… I didn’t really want to go, but it was an outing for William. Part way into the day, my cousin told me that she was expecting baby number 3, and she was 19 weeks. I was over the moon for her. My cousin and her husband are amazing parents to their two children, and they have so much love to give, so a third little one would have completed them. Sunday, 7 April 2013. It’s evening, about 9pm… My mum phones me to tell me that my cousin has lost the baby. There was simply too much liquid surrounding the baby, and it didn’t survive. I’m distraught for them. Tuesday, 9 April 2013 – Things are starting to look up a little. I get my car back. It feels strange to be driving again, but it’s a weight lifted. Wednesday, 10 April 2013. My cousin went in to hospital today to ‘carry’ her baby. It’s still 10 April… I’m literally in the car, pulling out the driveway to go to work. Michael and William are seeing me off, and Michael gets a phone call. He almost collapses at the side of the car… I have to pull William away from him, through my open drivers side window. Michaels grandmother has passed away throughout the night. There was nothing wrong with her… Other than the add aches and pains that the elderly normally struggle with. It was sincerely a shock to the system. It’s now Thursday, 11 April 2013. I find out that my cousin ‘delivered’ a little girl. Elsie Jayne. She was half a pound in weight. The following week, I have to take the Thursday and the Friday off work. Two funerals in two days. And in between, on the Thursday night, Michael and I prepared the buffet for the wake for the funeral of his grandmother on the Friday. On Sunday, 21 April 2013, we were off the ferry and driving towards our first destination, when we all fancied something to eat. Stopping at the nearest fast food place, we all piled in to KFC. Back into the car, we drove for approximately 40 miles when we reached Haarlem. My dad had been looking forward to visiting the Frans Hals art gallery, and so he scheduled this specific stop-over into our itinerary. We drove around the town for almost 30 minutes looking for somewhere to park. Eventually, we were all out the car when, yet again, disaster struck. After three quarters of an hour, we managed to find the roadside rest stop again, but we were on the wrong side of the road… Mum and Michael got out of the car, into the services and across the bridge… I stayed in the car with dad. We managed to turn the car around at an exit, approximately 2 miles away from the services. We were just back on the motorway when Michael phoned me. They’ve got the bag. Everything was still inside. It was exactly where it had been left… Hanging on the back of a chair, outside KFC in the sunshine. We’re all ready to go. I’m outisde, locking the kitchen door and I ask Mike to get the pram out of the garage. William, in all his excitement, follows Michael. He’s eager, almost running… He trips over his feet and the little step into the garage and uses his face for a break… An ‘egg’ appears instantly, as does a big bruise and scrapings… There’s blood spots… I start panicking, as per usual. His beautiful face. The spots of blood remained at just that. 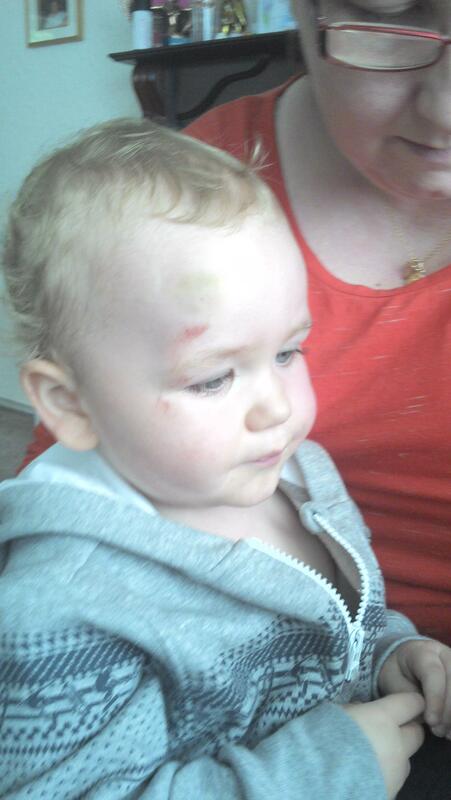 It’s a week later, now, and there is only a very small trace that he had injured his face at all. That brings us up to date with everything that has been going on with 2013. There is something else that is really annoying me, and will more than likely come to an end in 2013, but I can’t mention that here… I may blog about it when it happens, but I’m afraid you will have to remain on tender hooks for the time being. So, 2013, whatever else you have in store for me this year, you can keep it. I don’t need it.